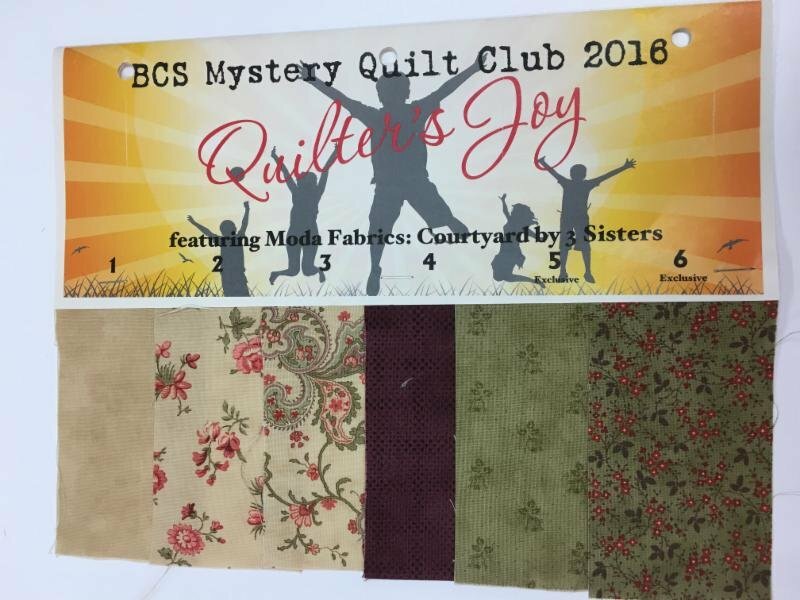 Share in the "Quilter's Joy" mystery quilt club. A mystery quilt is just that... a mystery to you! The mystery will keep you on the edge of your quilting chair until the very end. As always BCS has designed and written a quilt pattern that is systematic with organization tips that make it easy to follow. Club members will use beautiful fabrics of golds, greens, reds and purple and make a 98X98 inch quilt. Participants who have signed up for club remember first meeting is Sunday, January 22 at 10:30. Kits and pattern sections will be distributed at that time. Looking forward to seeing all of you! Kit Fee: $299 (kit includes: fabric top and backing, pattern (distributed in two parts), and club meetings.